In a small mixing bowl combine olive oil, red wine vinegar, mint, garlic, pomegranate and a pinch of salt. Place in refrigerator until ready to serve. Trim ends off of asparagus (approx 3-5cm off to get to the softest part). Lightly coat spears with olive oil and cook on medium heat over a grill pan or on your grill until seared to your preference. Sprinkle lightly with sea salt and pepper. Cut into 1cm pieces. 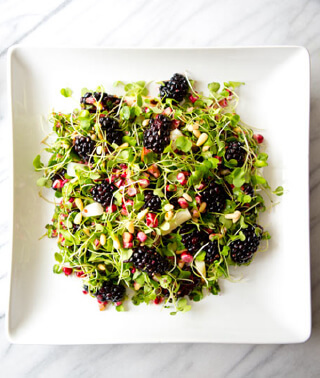 Assemble the salad by combining microgreens, corn, asparagus, blackberries and pine nuts in a large bowl. Add salad dressing, toss well and serve immediately!